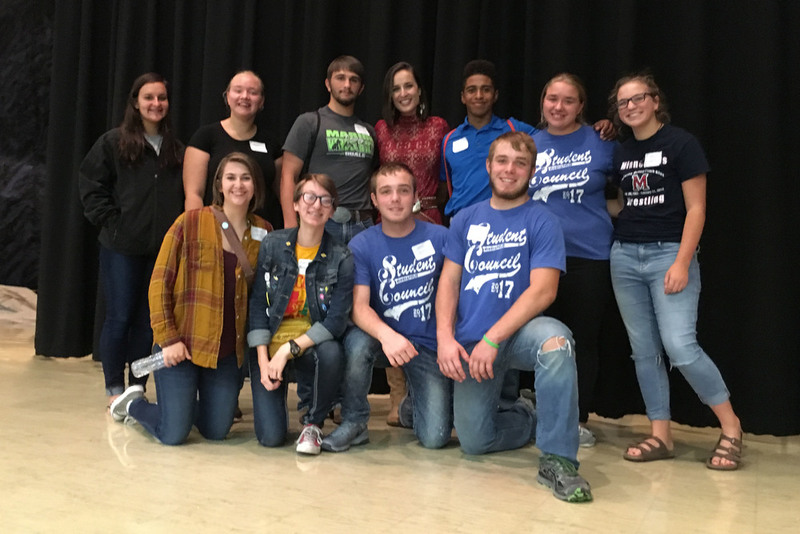 Ten members of the Minneapolis High School Student Council attended the Regional Student Council Conference at Beloit High School on Monday, September 25. The conference, sponsored by the Kansas State High Schools Activities Association, offers leaders from area high schools to exchange ideas and develop leadership skills as they embark on their servitude as student leaders for their schools. Conference attendance varies at each site with the range being from 200 – 900 students and advisors in attendance. Minneapolis students attending were Taton Smith, Zoey Rankin, Courtney Walker, Kaysie Grigg, Kalee Probasco, Mackenzie Probasco, D.J. Green, and Scott Kuder; student council presidents Keaton and Keagon Williamson, and sponsors Heather Bergmann and Jan Clark. Award-winning motivational speaker, Author, Entertainer and Miss Kansas 2005, Adrienne Rosel Bulinski is our keynote speaker. Through her messages and writing Adrienne talks about success and failure, depression and attitude, life’s obstacles, and how good financial decisions really does create opportunity. Adrienne puts it all out there, helping teens and adults make the right decisions not based on peer pressure, but based on their personal expectations of themselves.